Recently we were visited by two ladies who were researching Edmund Potter & Co Calico Printers of Dinting Vale, Glossop. 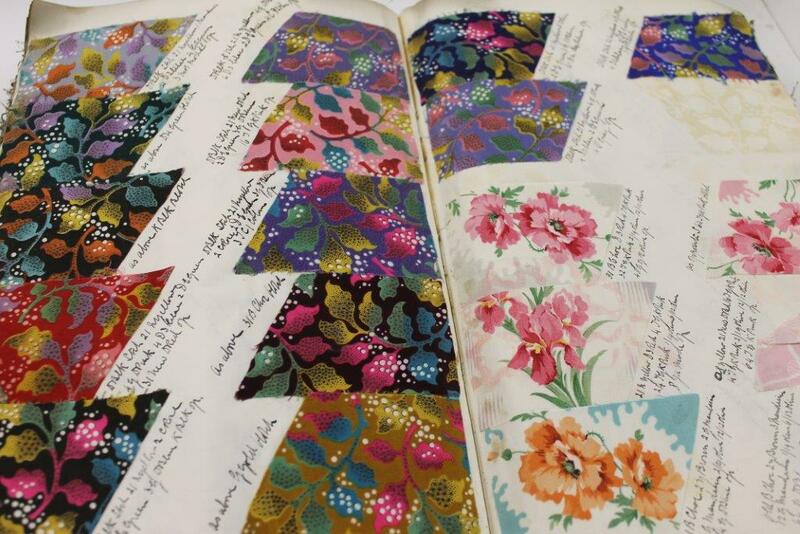 Edmund Potter & Co was once possibly the largest calico printworks in the world, and on checking our catalogues we discovered that we had an uncatalogued collection which no-one had been particularly aware of. The collection (D1589) was bequeathed to us by Alderman J G Hurst of Glossop, who wrote a biography of Edmund Potter and collected books and archives about calico printing. The collection contains a lot of printed books, which we didn’t usually collect (possibly explaining why it wasn’t catalogued at the time) – although of course now we also house local studies, that’s changed. 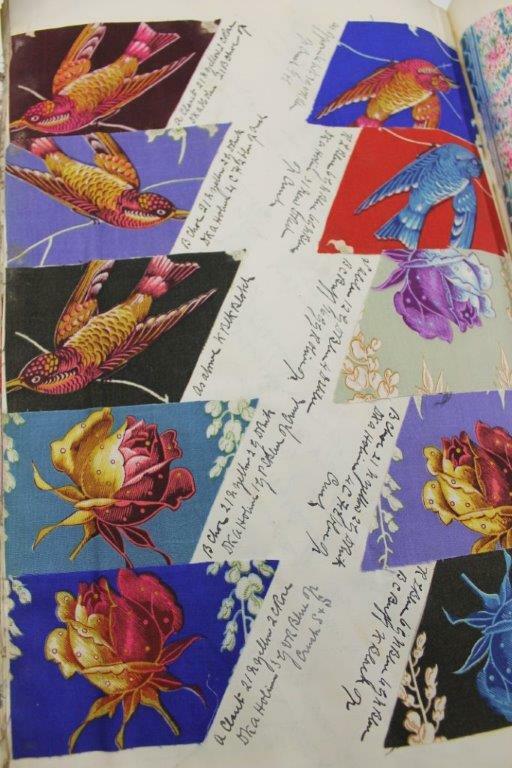 Delving into the boxes, however, revealed some beautiful original Potter & Co pattern books dating back to the 1850s containing swatches of fabrics in stunningly fresh colours. 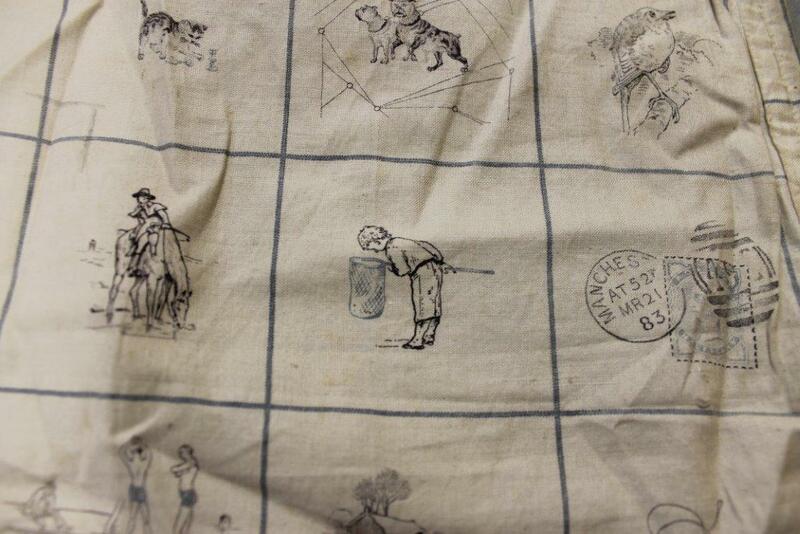 An even more unexpected find was a man’s shirt printed with tiny images, possibly from children’s illustrations. We don’t recognise the pictures and although one of them shows a Manchester postmark. If the date on that postmark is anything to go by, the shirt would date to around 1883. So what’s the Beatrix Potter connection? Well, Edmund Potter was Beatrix’s grandfather and according to one of the ladies who came to look at the collection (she is an expert on Beatrix Potter) he used to send the young Beatrix fabric samples which she would use to make up little outfits for her toys. She would then make paintings of those dressed up characters… and of course these ultimately developed into her famous books. 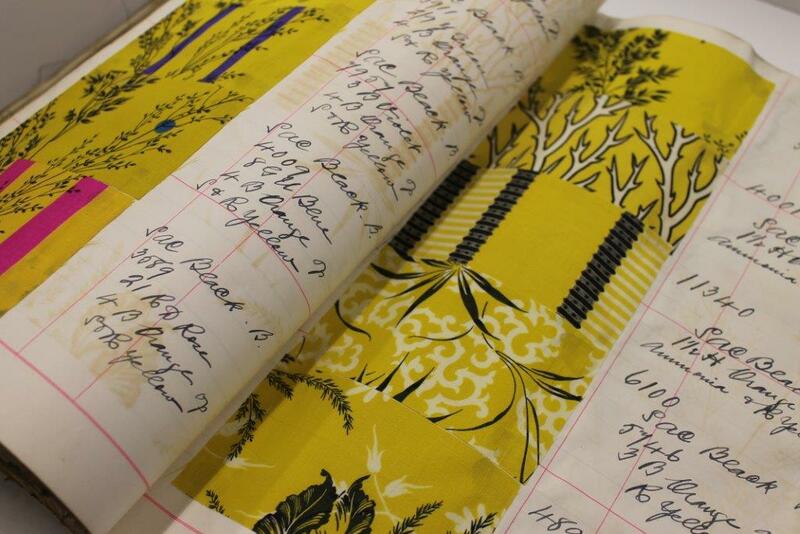 She also used the fabric to bind her own books and folders of her paintings. Now that we’ve rediscovered this wonderful material, we’re cataloguing it so that more people will be aware that it’s here. But isn’t it nice to think that Mrs Tiggy-Winkle and other beloved Beatrix Potter characters may have been clothed in some of the fabrics tucked within our pattern books? 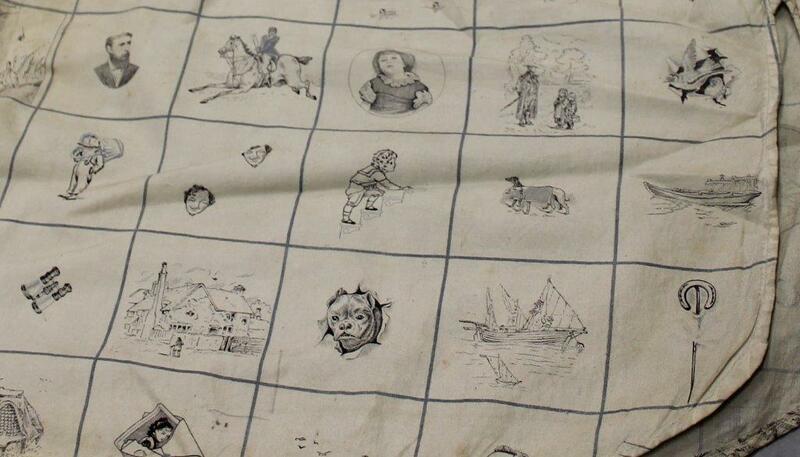 Oh, and if you recognise any of the characters printed on the shirt, please tell us, as they’re a complete mystery! The Global Cotton Connections project funded by the Arts and Humanities Research Council is looking into the more global aspects of the Dinting Vale Calico Printing works. We are finding that in the early 20th century particular prints and methods were geared to specific global markets. We have found particularly interesting comments so far in relation to African markets. Thanks Susanne – that’s really interesting. The Dinting Vale material we hold doesn’t include any of the standard business records (minute books, ledgers, accounts, order books, etc. ), so we don’t have much that can put the pattern books into context. 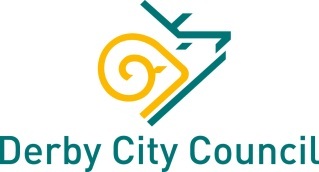 We very much look forward to the final results of your project. Isn’t the shirt odd? 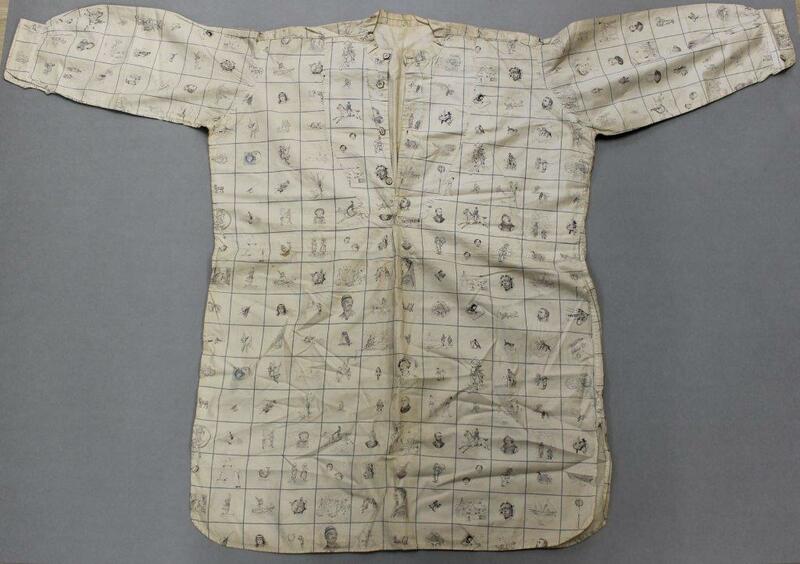 I can’t imagine anyone actually wearing such a thing, so I assume it was made for a special purpose – although, the colours and patterns of the fabrics show that the 19th century was a lot brighter than the old sepia photographs suggest, so perhaps a few men did go around in bizarrely patterned shirts! We were very excited to find such a lovely collection so I’m glad you enjoyed reading about it too. A really interesting collection to read about. Thank you.